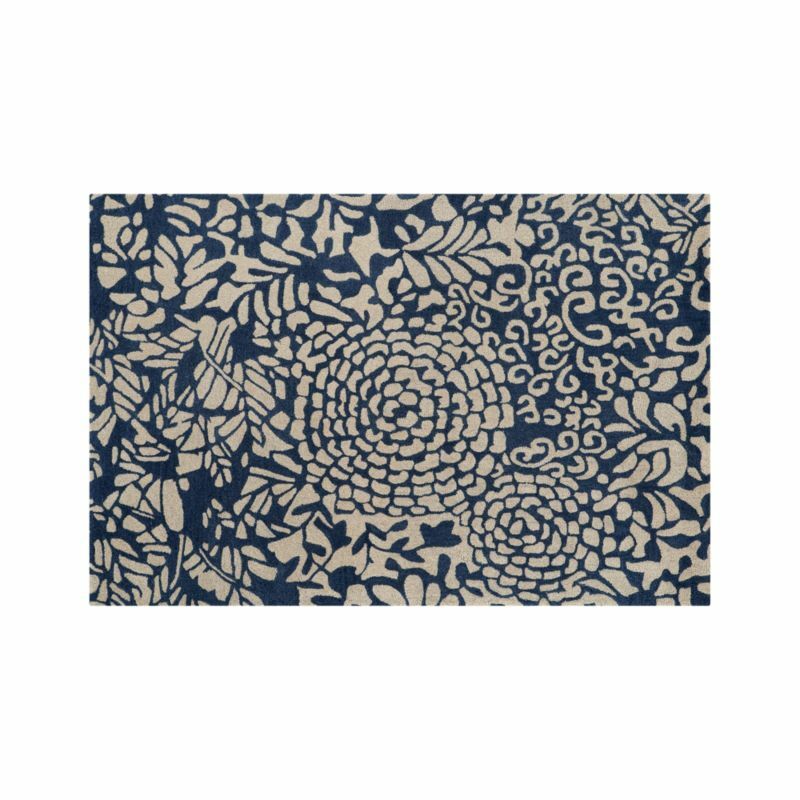 Between looking for rugs for my own house and helping a friend refresh the look of her living room, I feel like I’ve been spending a lot of time scouring the web for great rugs. There are so many awesome rugs out there to chose from! Some are solid, simple colors, others bold patterns. Some boast newly conceived graphic designs, others are inspired by antique, Oriental, or Turkish rugs. All in all, what I have been learning is that you can really make a statement with the rug you choose for a room, and it can be a lot of fun to allow that rug to inform the decisions you make when accessorizing the rest of the room! Here are some of my favorite rugs I’ve come across recently. I first learned of Alyson Fox while reading Design Sponge a while back, and have been dying for the right place for this rug ever since. I have been experimenting with grays and taupes lately, and what I love about this rug is that it favors gray but still uses a variety of other colors and geometric shapes to break it up a bit. And that pop of red is so striking! I do love a good floral pattern, but it has to be unique… not like the fabric from your grandmother’s rose covered window curtains! I like this pattern because it’s modern and hints at the flowers and their surrounding leaves, but also takes some liberty in improvising with whimsical curls and the reversing of positive and negative space. And since it is two-toned using only a creamy white and a deep blue, you could pair this with any number of neutral or bright accent colors. If you’re looking for a bright pop of color in an otherwise fairly monotone room, this could really make a bold statement. I love the contrast of the teal with white, and this herringbone pattern is pretty popular lately (along with chevron, and a few other similar patterns you’ve probably seen around). Compliment this with some teal accessories, and you’ll have yourself a cheerful, bright room for reading, playing, or entertaining. This one is reminiscent of a traditional oriental rug in it’s colors and shapes, but also in the vine-like configuration surrounding the more central, pointed-tip flowers. (Of course this is a much more modern take on it.) I love the symmetry of the design, but also the variety of the shapes used. And the way the burnt red flowers pop out at you is delightful. What’s unusual about this one is the texture, and I love it! While it could be a bit of a tease for your toes, the raised crisscross pattern not only breaks up the otherwise neutral rug with it’s intersecting lines, but the shadows thrown by the raised fibers give it a kind of dimension that most rugs can’t accomplish with a single uniform fiber height. As for why I chose the rugs I did for our dining room and living room… Well, it was a bit of a progression, since we did one room at a time! In the dining room, the house came with wonderful rust-colored tin ceiling tiles installed in the dining room, which we loved! However, we also love our blue clay dishes from Crate and Barrel. So the goal was to find a rug that would bring together the warm orange from the ceiling and the cool blue of the dishes. After choosing gray-toned woods for furniture and then fishing around for quite a while for the right rug, I found this one from Anthropologie. Next was the living room rug. We have a beautiful gray sofa I had been eye-ing for months before we finally got it. Once we finally had it in the house, I set out to find the perfect rug. Since I purposefully chose a sofa that would be neutral enough to go with almost any color, I could be fairly flexible. However, since our dining room is through a wide doorway that is open to the living room, I wanted to be sure that they flowed with each other well. So when I found this rug, again at Anthropologie, I knew it was the one! 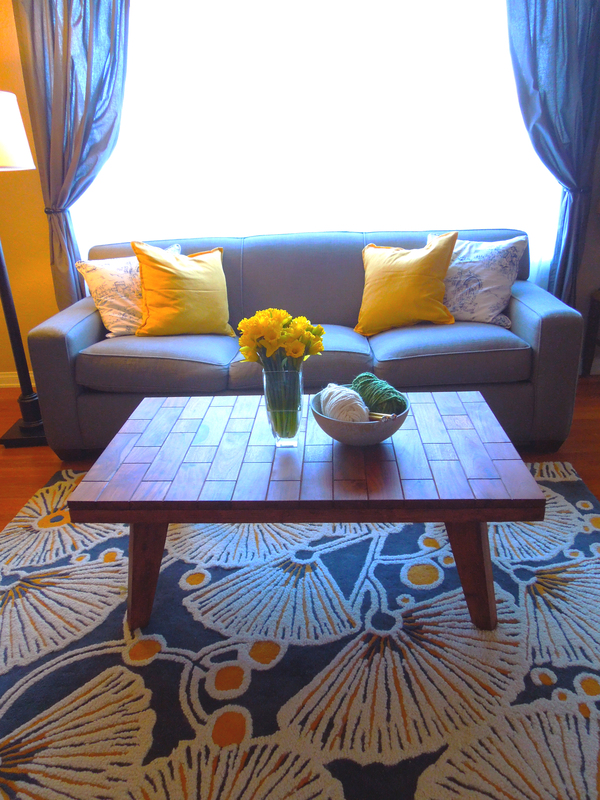 Before finding this rug I’m not sure I would have thought to use yellow as an accent color in the living room, but now that it’s here I can see that a warm shade of yellow is the perfect color to brighten up the room. I love walking out into the living room in the morning to such cheery decor. It starts me off with a smile! Which of these rugs is your favorite? What do you like most about it? This entry was posted in Design and tagged #accessories, #alysonfox, #anecdotalgoat, #Anthropologie, #arearug, #crateandbarrel, #decor, #decorate, #design, #diningroom, #interiordesign, #livingroom, #modern, #orientalrug, #potterybarn, #restorationhardware, #rug, #tinceiling, #urbanoutfitters, #whyilove. Bookmark the permalink. My favorite is the Festival Rug. 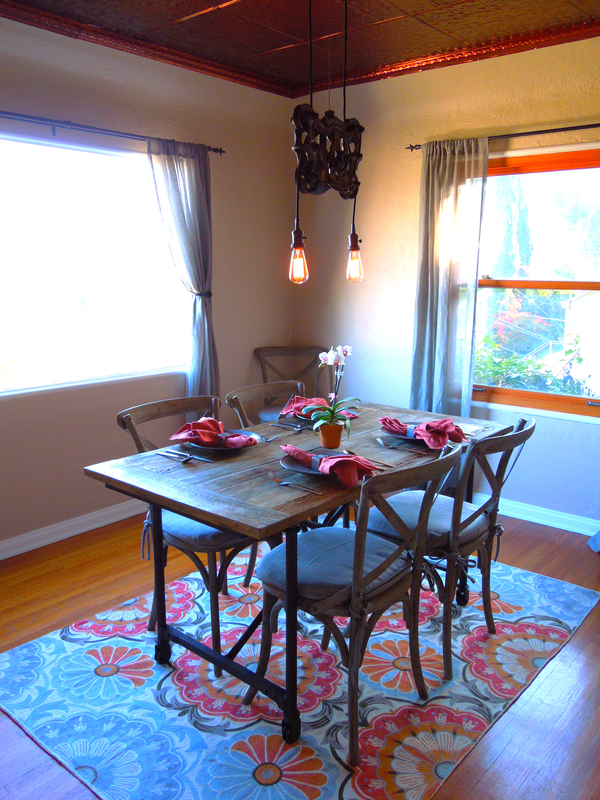 And the photos of your dining room highlight it’s beauty! Thank you so much for sharing. I need to add rugs to my wishlist now! I know! Rugs are surprisingly difficult to get right, but when you do find “the one”, I’m sure you’ll know right away. It pays off to take your time to make sure you get it just right! Thanks! 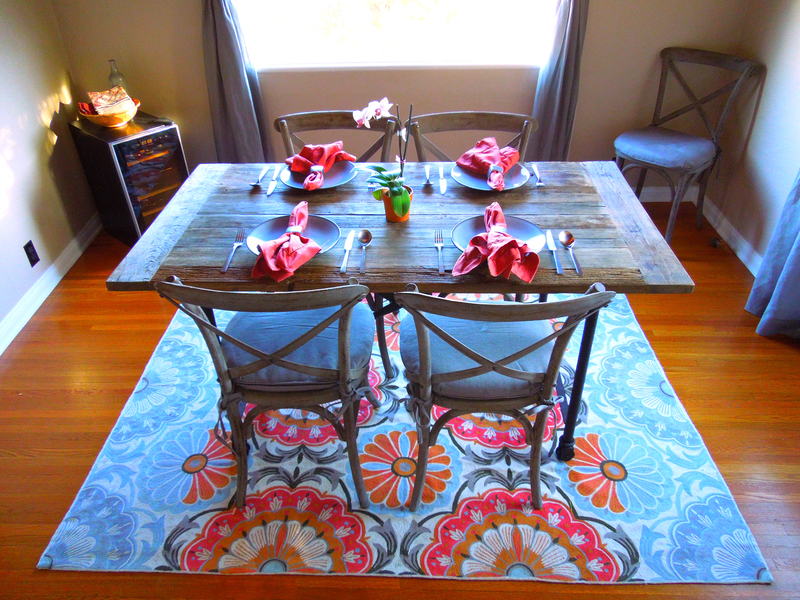 Rugs can be one of the more expensive pieces of a room, but they’re worth it once you find the one that speaks to you! What a great way to liven up any living space!! !